We may require to display some part of the records returned by a query specifying a range. What is the range to be returned we can specify by saying the starting and ending record number. 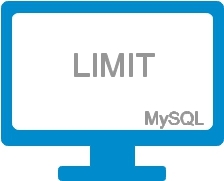 We will pass this starting and ending number along with the SQL LIMIT command to restrict the records within that range. We will see the syntax of this query in our student MySQL table. In MSSQL we can use TOP query to display required number of records, similarly in Oracle we use ROWNUM to collect required number of records. In the above example the 10 records will be displayed based on alphabetical order of class column. Some sample records are here. List of students with Mark above 80 ( ten records only ) in the order of lowest to highest. Recently added five records of a table. If your table have auto increment unique id or time stamp field then you can display recently added records like this. Here id is an auto incremented unique field. Here dt is time stamp or date and time field. This is quite useful for designing paging in any script. Paging is known as displaying records in page wise with fixed number of records per page. There will be navigational menu to move between any pages and go to next and previous pages. The best example of php paging is the way google display search results. It display an easy navigational menu at the bottom of each search result page to go to next or previous page or any other page. Note that this is returning number of records and this has no connection with the id number field used here. If the ID numbers are different then also the query will return 10 records starting from 21 record ( irrespective of the ID numbers ). If you want records with particular ID range specified then you have to use sql between command. You can read more on mysqli connection string here. I am just looking for an equivalent to top clause in MS SQL SERVER 2005 that follows where clause (something similar to Limit in Mysql). I require this to be used in another application to retriev the latest record from DB. The clause that comes next to select cant be used. Can you please help me. This is not for listing of tables of a database. i have a table, table name is "employees" and i have insrt duplicates values more than two times. now i want remove that values but want to put one value only waht i do in sql server query. how can you display all the marks below 80 on the webpage or any other limit?